Heraldry: Herald in the News! 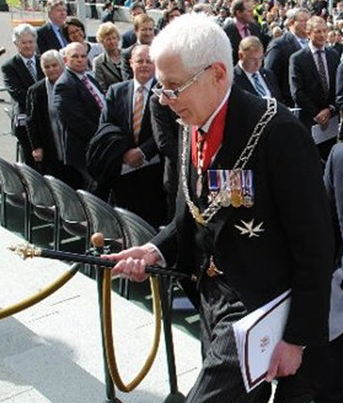 Heraldry at London's "Cathedral of Sewage"
A College of Arms "Mashup"
Philip O'Shea, New Zealand Herald of Arms Extraordinary since 1978, has been honored by Queen Elizabeth II by being made a Commander of the Royal Victorian Order. (He was previously a Lieutenant of the RVO, and is a Companion of the New Zealand Order of Merit. Our heartiest congratulations go out to Mr. O'Shea on this honor. It's always nice to see a herald recognized for his work.